Italian Interior Minister and leader of the populist party Lega Nord Mr. Matteo Salvini is stuck in another standoff with the EU, this time over the faith of 177 migrants that were rescued at sea by the Italian coast guard. Their ship, the Diocotti, has brought them to Catania, Sicily but Mr. Salvini has made it clear they will not be allowed to set one foot on Italian soil till the EU assures him of a distribution plan for the migrants in other EU nations, as was agreed upon during a Brussels summit a few months earlier. Mr. Salvini is playing hardball and his voters love him for it. He is still the most popular politician in Italy according to recent polls. The passengers, African migrants who were stuck on the Ubaldo Diciotti for five days and arrived at the Sicilian port on Monday evening will not be allowed on land until “Europe steps in to help”, Salvini declared today to online cheers of Italians. 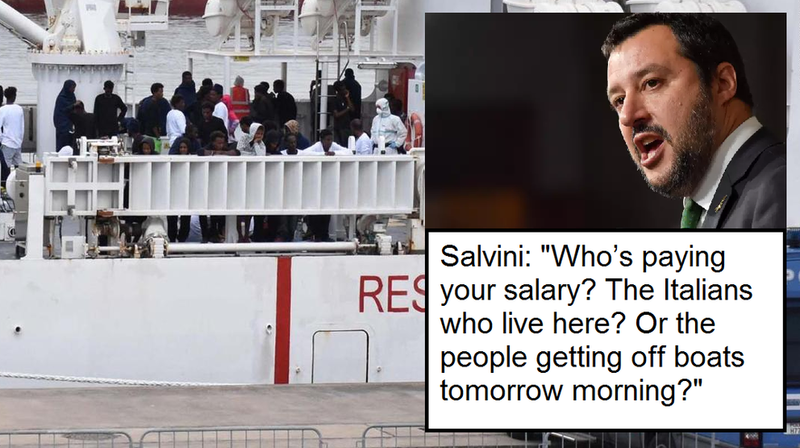 Related coverage: <a href="https://thegoldwater.com/news/31216-Italy-Salvini-Refuses-New-Migrant-Ship-Carrying-450-Right-To-Dock-In-Port">Salvini refuses new migrant ship carrying 450 right to dock in port</a>. Related coverage: <a href="https://thegoldwater.com/news/34075-Italy-Salvini-Blames-Toll-Operator-Autostrade-For-40-Dead-In-Genoa-Catastrophe">Salvini blames toll operator Autostrade for 40 dead in Genoa</a>. To this news, Mr. Salvini stated that he considers the current halting of the ship as a ‘technical stop’ and not as a potential disembarkation. Criticized for the move during a debate, he stated: "Who’s paying your salary? The Italians who live here? Or the people getting off boats tomorrow morning?" Well done Italy. These invaders have plans to destroy every country they step hoof in. (No, that was not an autocorrect error, they're devils) As for violation of article 5 in the UN declaration of human rights, its nothing compared to the rights of every civilized man woman and child they've taken away by allowing this invasion to happen. The UN/ EU have violated almost every other article in that declaration towards conservative people. They pick and chose what suits their evil agenda in that matter. So they can shove it. Can't he just tow the ship back to Africa? SEND THEM BACK TO WHERE THEY CAME FROM AND NO MORE PROBLEM! It is great to see another country, (eg Hungary) with the backbone to stand up to these globalist maniacs in spite of their bully tactics. Instead of like others we know, that just roll over and take the bitter pill as commanded… Perhaps Italy has taken a "what not to do" lesson from Sweden, which is already on its way to hell in a handbasket.. plenty of others still in early stages yet.. but to let Islam take any kind of hold on any country, the peril is of following in Sweden's footsteps to eventual annihilation. So Italy may save the day yet… but will be the hard slog.